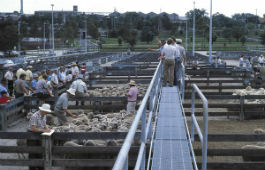 The National Livestock Identification System (NLIS) is Australia’s scheme for the identification and tracing of livestock and is crucial in protecting and enhancing Australia’s reputation as a producer of quality beef and sheepmeat. Australia exports to over 100 markets and is one of the world’s largest red meat exporters. The NLIS allows Australia ongoing access to these valuable export markets. The NLIS also enhances Australia's ability to respond quickly to a major food safety or disease incident using the NLIS database as a critical tracing tool. The NLIS is a key industry and government partnership across Australia. NLIS Cattle was introduced in NSW on 1 July 2004 and involves electronic identification of cattle and recording of all cattle movements in the NLIS database. Cattle are identified with approved NLIS ear devices, or rumen boluses and a matching ear tag. All movements of cattle to sale, slaughter or to any other property are recorded in the NLIS database. .
NLIS (Sheep and Goats) was introduced on 1 January 2006 and in NSW is a mob based system. NLIS (Sheep and Goats) uses a combination of visually readable ear tags printed with a Property Identiﬁcation Code (PIC), an NLIS movement document which accompanies every mob of sheep or goats when they move, and the recording of all movements of sheep and goats in the NLIS database, to provide traceability. Learn more about our range of available courses. Record livestock movements between properties and information about your livestock and/or property.